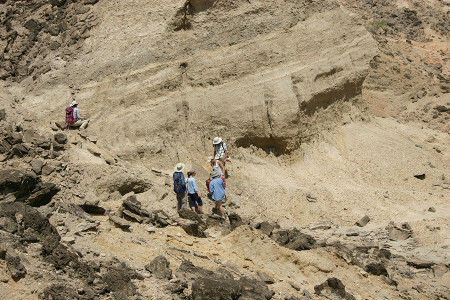 Interpreting and reconstructing depositional environments of the past involves an understanding of modern processes acting on the Earth surface that can form a particular rock and/or sequence of rock layers. 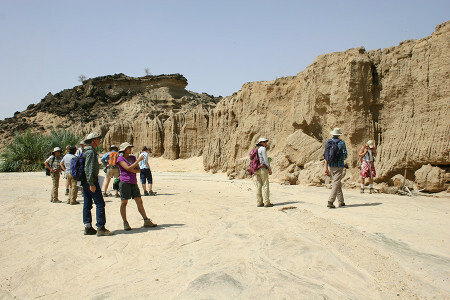 In the Turkana Basin, the bulk of the last 4 million years are made up of ancient river deposits. 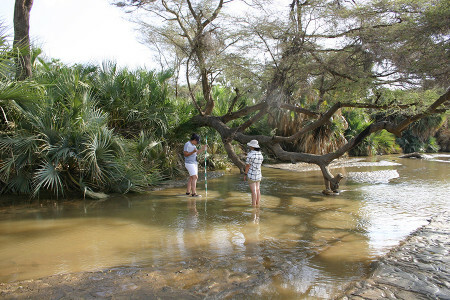 One river in particular, the Omo, has had a major influence in the Turkana Basin for this span of time. In contrast, the modern Turkwel River next to the TBI campus supplies <10% of the water and sediment into the present Lake Turkana and is believed to have played a minor role in the geologic history of the basin. 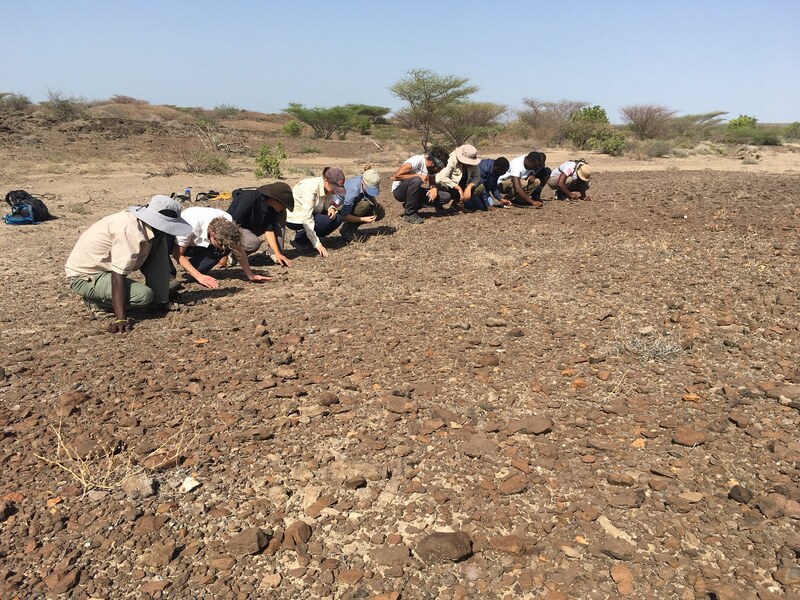 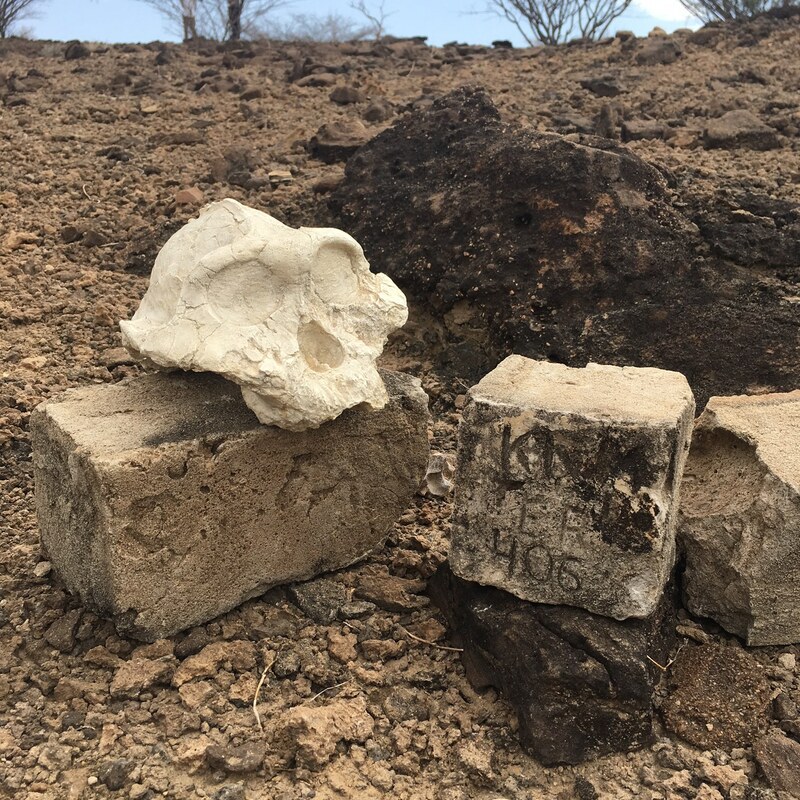 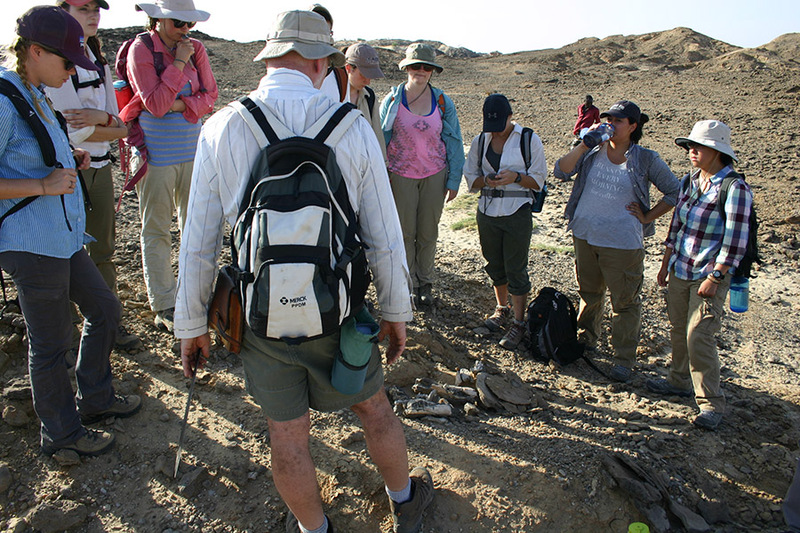 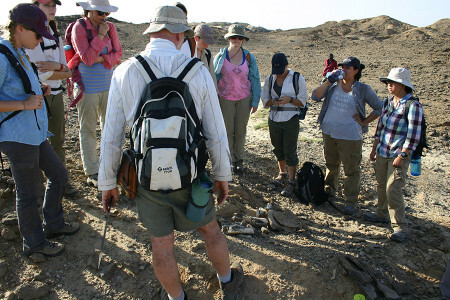 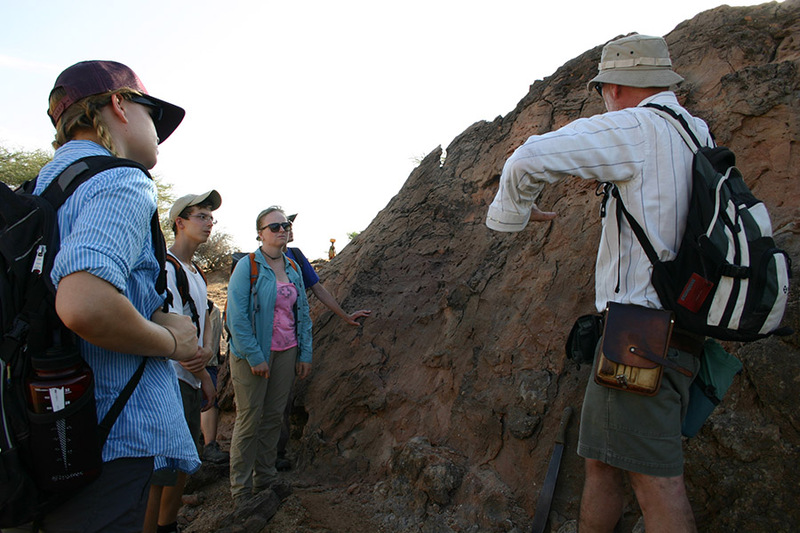 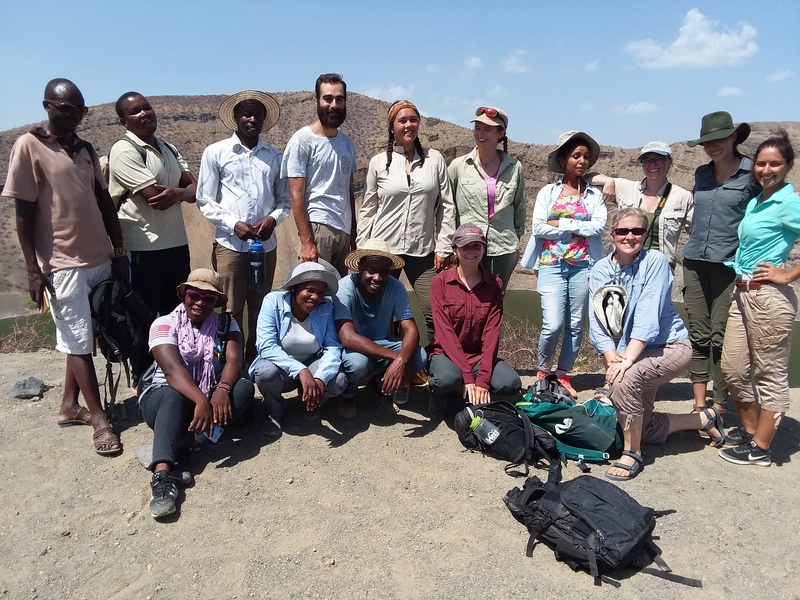 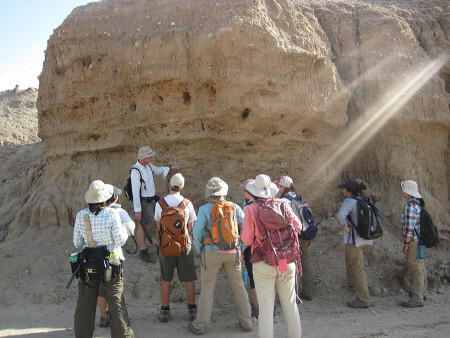 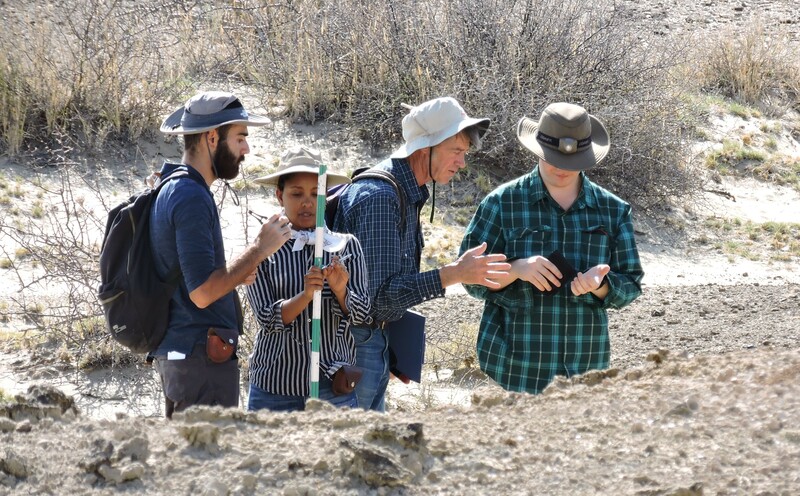 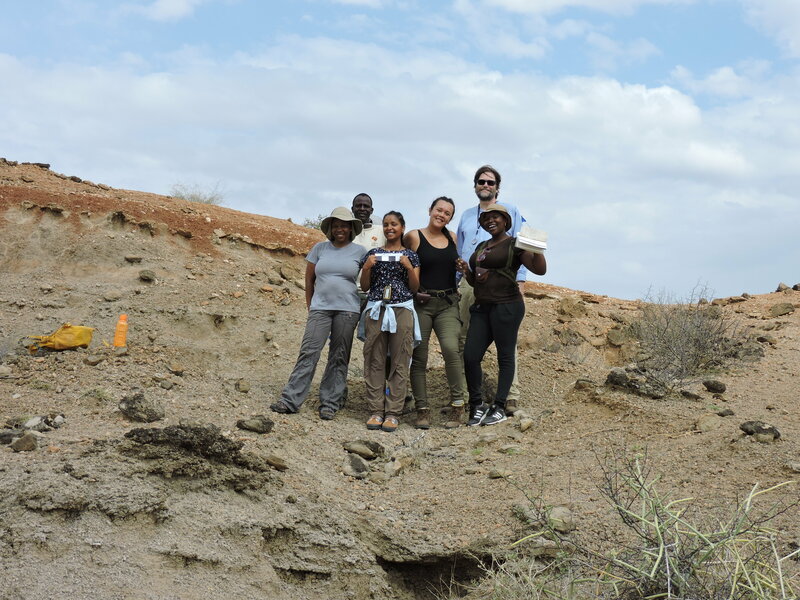 TBI field school students first Geo project involved an examination of the modern Turkwel River and comparing it to two ancient Turkwel River deposits that are ~3.6 million year old and <10,000 year old. 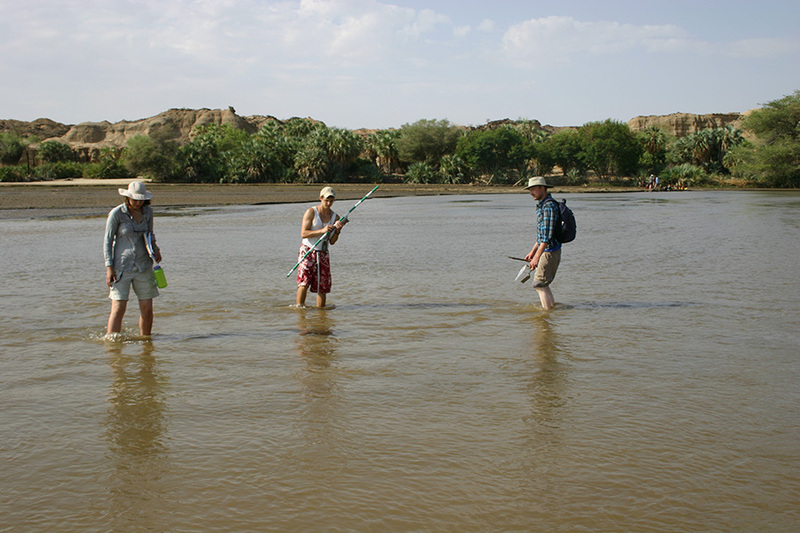 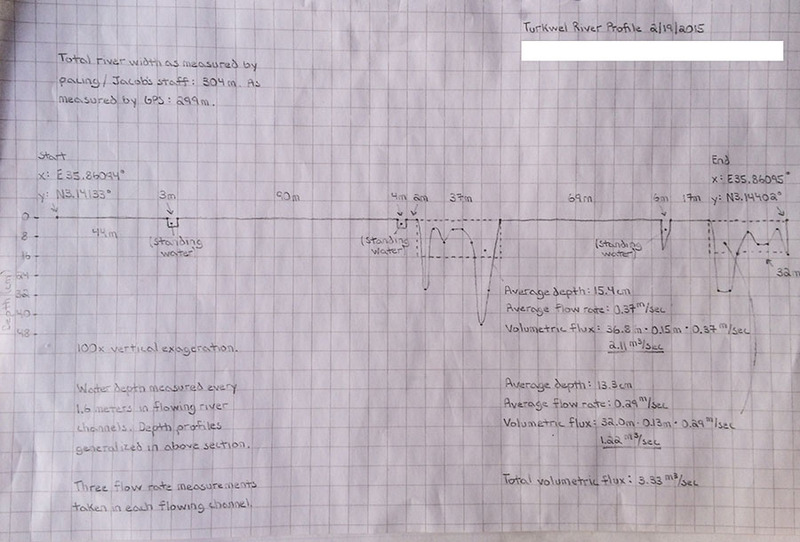 In this study of a modern fluvial system, students measured the flow velocity and depth across the Turkwel River. 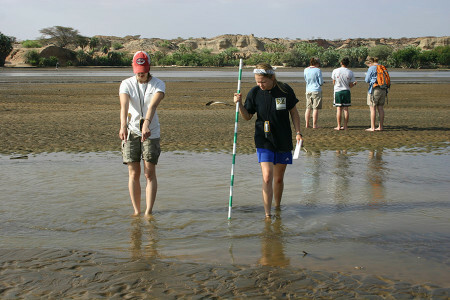 In addition, they examined the composition and size of sediment across the channel and noted different features such as ripples, laminated sand, and small dunes. Aileen and Sam begin at the north bank of the Turkwel River. 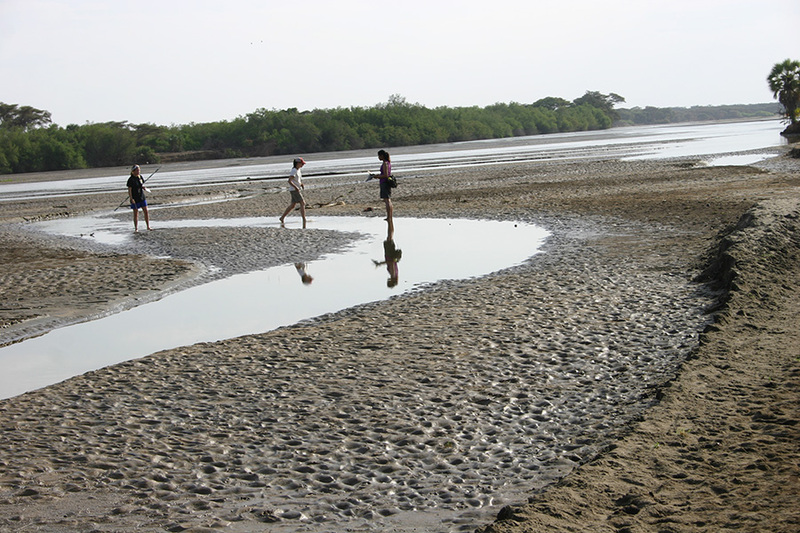 This is just one of many channels across the Turkwel River near campus. 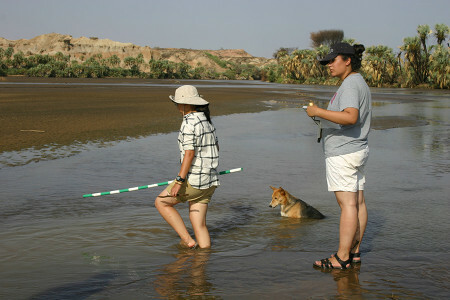 Larisa points out a change in channel topography while Rachel measures the depth. 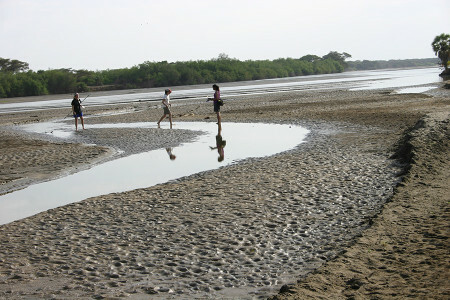 One group near the south bank of the river (white sands on the left). 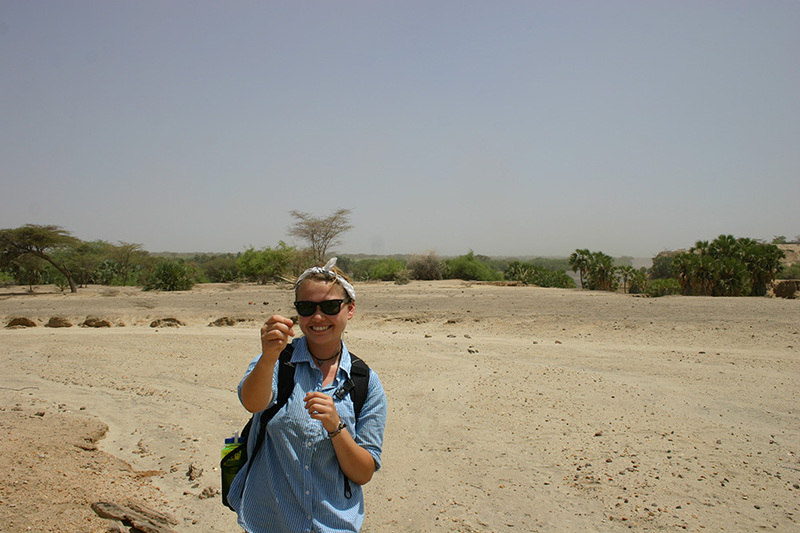 Check out the small dunes. 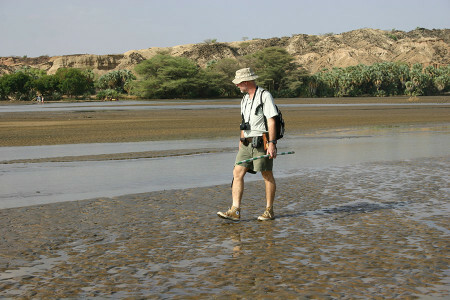 Dr. Feibel looks at insect and birds traces on the muddy sand. Kate, Dylan, and Mike explore a large channel. Tom wanted to help Sam and Aileen measure flow velocity. Turkwel River profile with stream velocity. Dr. Feibel points out cross-bedding within the sand deposit. 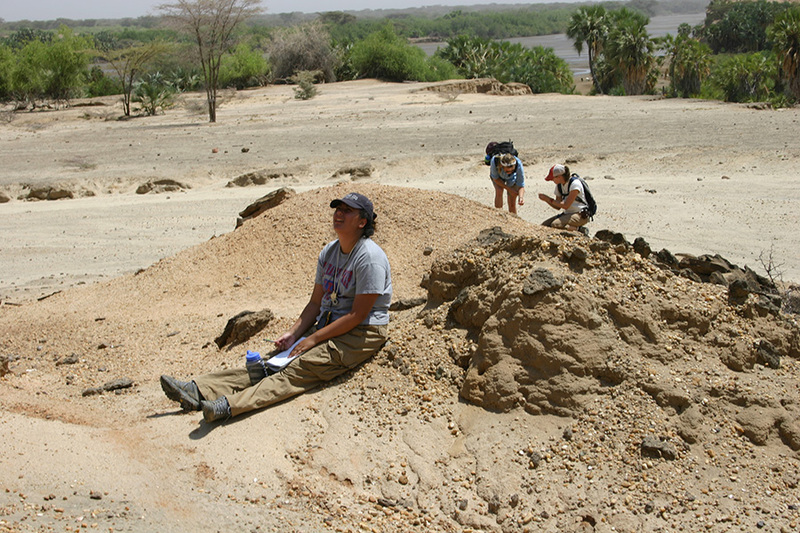 It’s understandable that crocodile, hippos, turtles, and fish fossils are common in these ancient river deposits. We found this pile of fossils but we don’t think it all accumulated naturally in this exact spot. 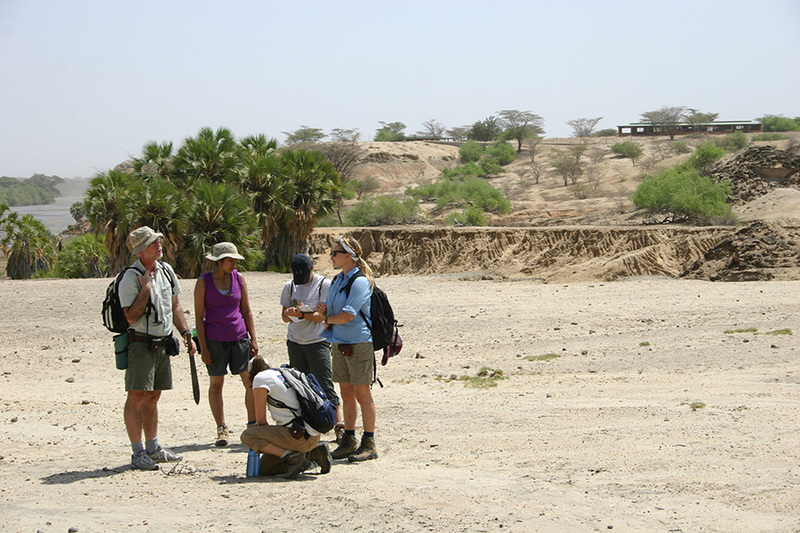 Note the gravel from the paleo-Turkwel River channel. Dr. Feibel stands in front of the Lokochot Tuff dated at about 3.6 million years old. 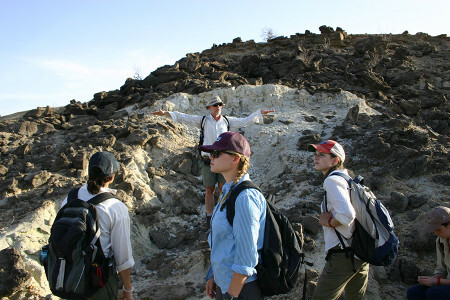 Here he describes what the landscape looked like when volcanic ash blanketed the landscape from the Ethiopian region. 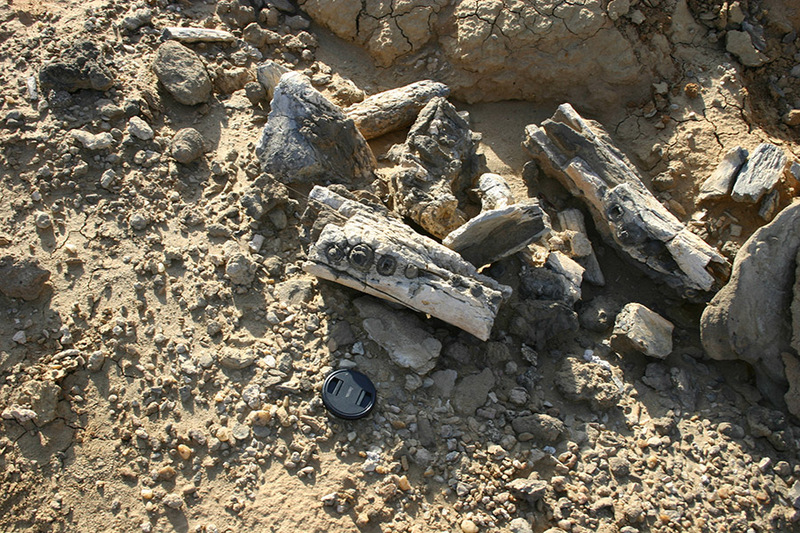 This tuff has also been found in sediment cored from the Gulf of Aden. <10,000 year old deposits of the Galana Boi Formation near TBI. 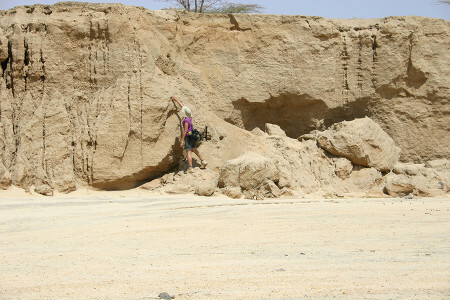 Stream cut of <10,000 year old sand and gravel deposits. Linda extracts a cobble out of the outcrop. How close was the source material in order to have such large clasts? 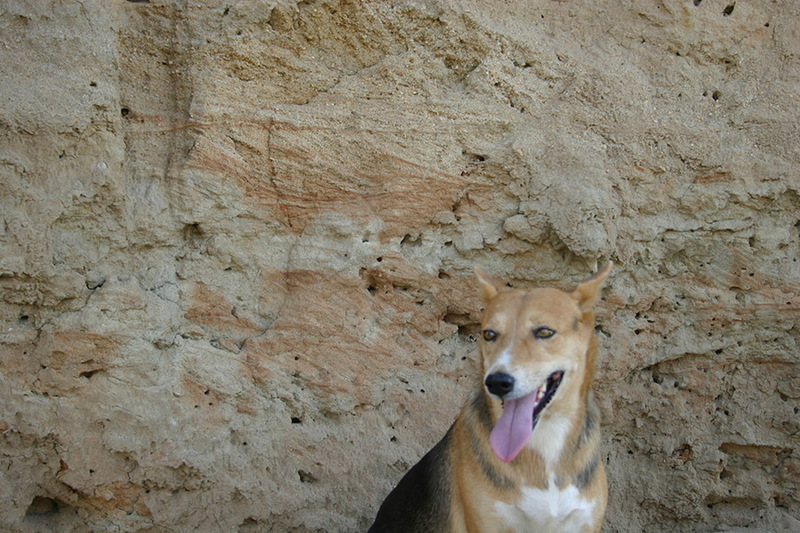 Larisa gives her interpretation of the past landscape. 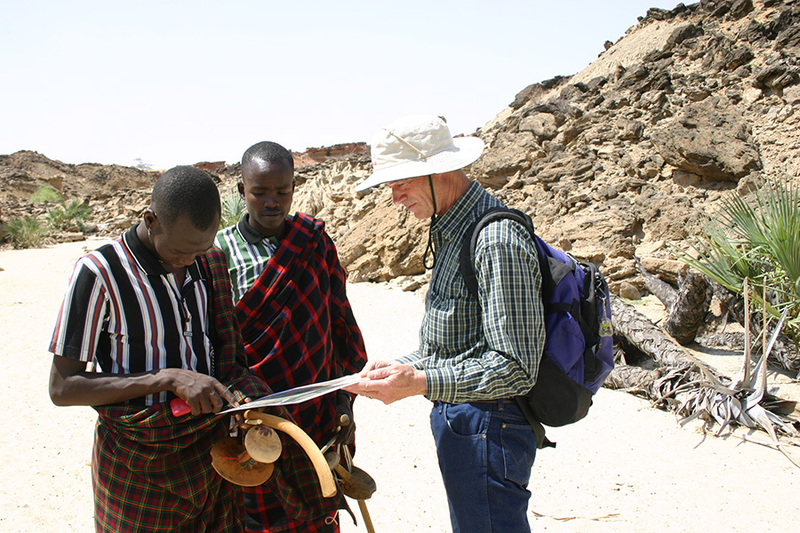 Professor Reynolds shows local Turkana a satellite image of the area. Dr. Feibel listens as Rachel gives her interpretation of the area. 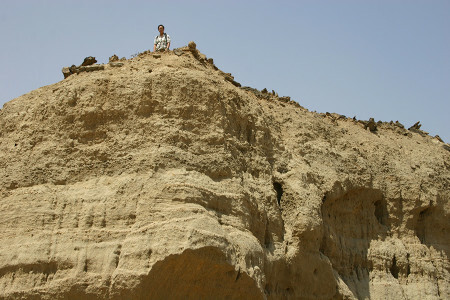 Aileen wonders why Sam decided to climb to the top of the outcrop. Sam examines the pebbly sandstone at the top of the outcrop covered with cryptogams. The nearly 3.5 million year old deposits behind the group are not quite horizontal like the <10,000 year old beds. 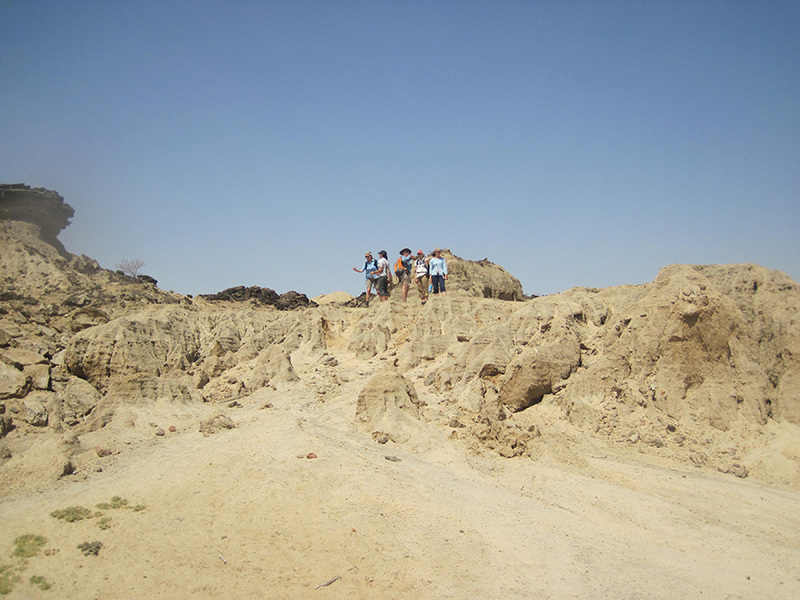 This is the result of a fault that tilted the older beds before the younger sediments were deposited. 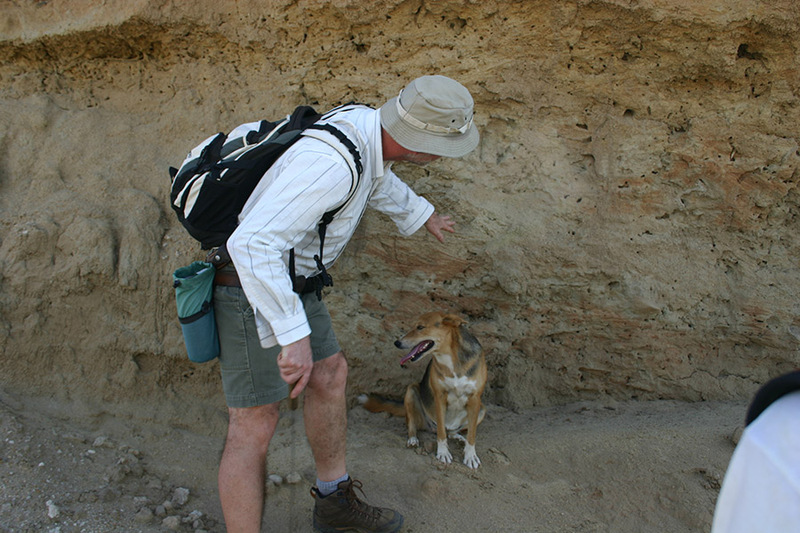 There is an unconformity of about 3.5 milliion years in this pic. 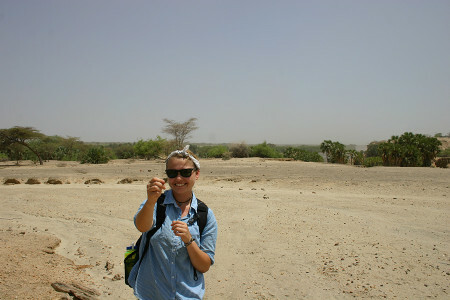 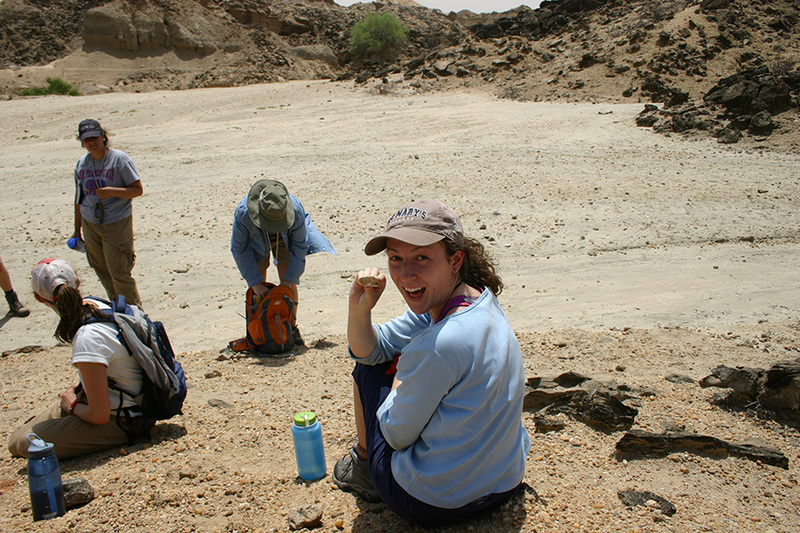 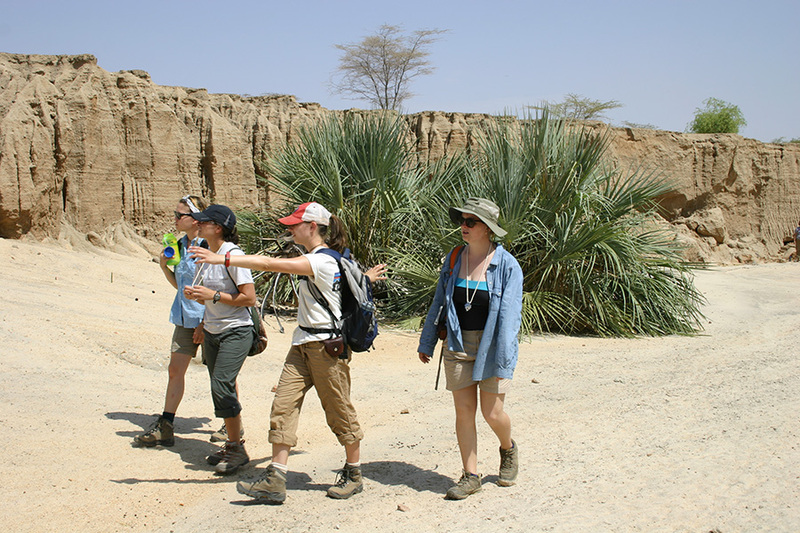 Page gives her interpretation of the paleoenvironment at South Turkwel. Students learned that the modern Turkwel River flows unnaturally year-round due to regular water release from a hydroelectric dam hundreds of kilometers upstream. Before the construction of the dam, the Turkwel would seasonally have high discharge and much coarser sediment load with gravel and coarse sand. 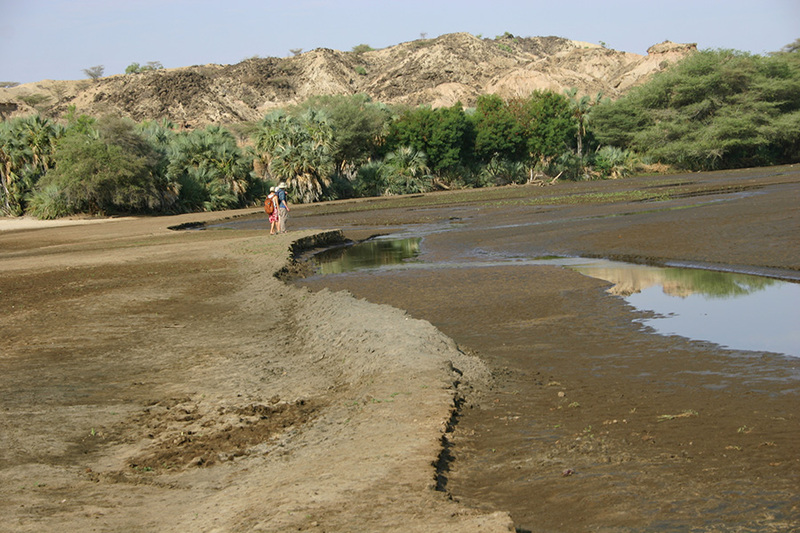 Although it now contains medium to fine grained sand and mud, the Turkwel River is still like other braided rivers with a network of small channels separated by mid-channel sand bars. 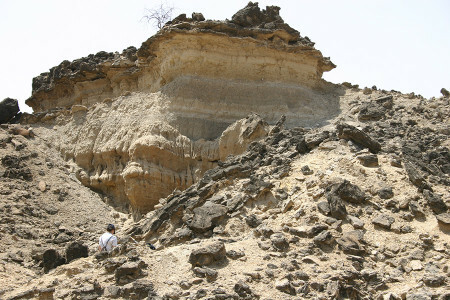 Therefore, it appears that fluvial deposits of the past explains what the present could look like. 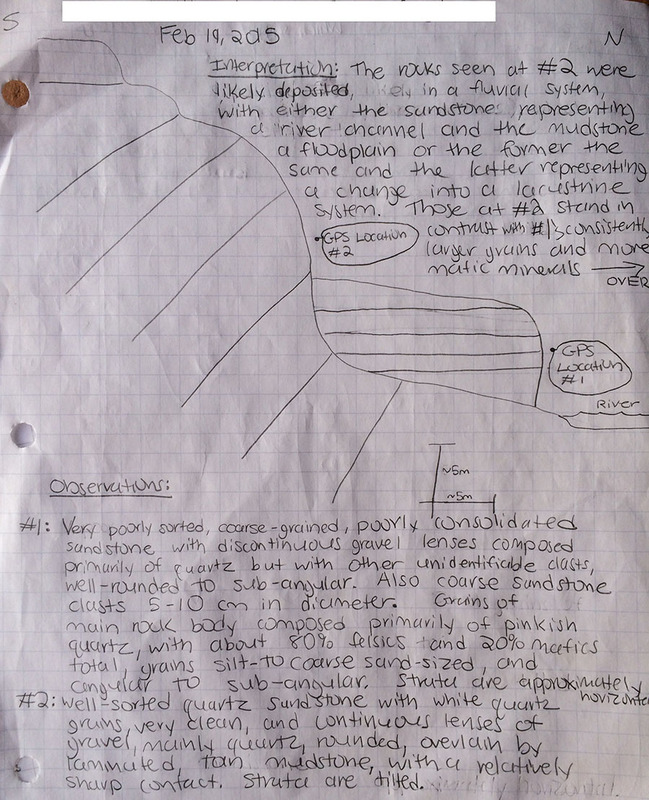 One group’s interpretation with a good description of the sedimentary deposits.